Williston Central School student Alec Distler, 14, chose entrepreneurship as his eighth-grade challenge project. Last summer Distler took his favorite family recipe, and his all time favorite snack, and created the business Alec’s Spicy Pretzels. These hard sourdough pretzels sprinkled with herbs and cayenne pepper have been flying off store shelves all over Chittenden County. They are in nine stores countywide. Distler’s new company has made about $9,000 to date. He just launched a new Web site www.alecsspicypretzels.com for people to purchase the snack online. 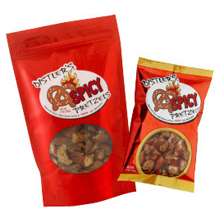 Where did your idea for Alec’s Spicy Pretzels come from? As part of our social studies class in seventh grade, we were taught how to sell and buy things from each other with fake money. My family used to make the spicy pretzels all of the time at home and so I just started making them more and putting them in little baggies to bring to school to sell. They sold for $300 each (in fake money). By the end of the year I was the richest person in class. It was such a big hit I had to do it for real. Well, it’s my grandma’s recipe and we have just always made them for holidays and special parties and stuff. How did you get them into stores? We had to get health inspected. Then I visited each location and gave them a sample bag and told them my story. Probably pay for my sisters’ college and my college. I have donated $1,500 to the Burlington Emergency Shelter and $1,000 to the Chittenden County Food Shelf so far. Getting into Fenway and to expand through and outside of Vermont, too.